The Blackstone River Coalition recently congratulated Millbury Federal Credit Union for participating in the In Business for the Blackstone program and acting to reduce the impact of the credit union’s storm water runoff. Dona Neely, Blackstone River Coalition program coordinator, presented credit union staff members with an award certificate and window decal to acknowledge their accomplishments. Joseph F. Barbato Jr. , president and chief executive officer of Millbury Credit Union, said he and the staff were honored to be the first business in Millbury to receive such recognition. Senior managers of the credit union, members of the Coalition, a representative of the Millbury Improvement Initiative, and an adviser and members of the Millbury Junior Senior High School’s environmental council group attended the Jan. 12 program. Each of these organizations will play an active role in encouraging other businesses in the community to participate in this voluntary leadership program that addresses a significant source of water pollution. 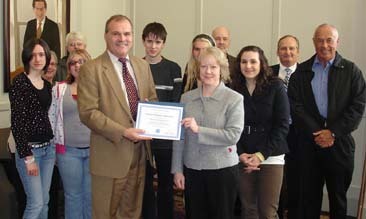 The credit union was pleased to participate in the In Business program. "Once we get the Blackstone River clean, it is important that we all do our part to keep it that way," Mr. Barbato said in a prepared statement. Wayne Cormier , facilities coordinator, took responsibility for ensuring that property maintenance staff understood the importance of properly addressing spills in the parking lot and minimizing the risk of oil, trash and other pollutants in the rain or snowmelt that runs off the property and into catch basins that discharge into the Blackstone River. Both Mr. Barbato and Mr. Cormier said that the program emphasizes the importance and value of efforts that were already in place to keep the property well maintained. The Coalition’s In Business for the Blackstone program educates small and mid-sized companies in the watershed on the detriments of polluted storm water runoff and encourages the adoption of good housekeeping practices that can be implemented into daily operational routines. For more information, contact Ms. Neely, In Business coordinator at 508-878-1728, dona.neely@zaptheblackstone.org.